In case you don`t know how to install laminate flooring on concrete, we advise you to hire professionals to do the job. Installing laminate flooring over concrete is not complicated but there are some directions that have to be followed for reliable and long lasting results. Process starts with correct preparation of underfloor. Concrete surface has to be dry, levelled and clean before good quality underlayment is installed. Laying underlayment is also time consuming process because it has to be done carefully to avoid any damage. If underlayment gets damaged, it loses its protective functions. It is advisable to install vapour barrier for extra protection of laminate flooring against humidity of concrete. Vapour barrier is placed between concrete surface and underlayment. After all protective layers are laid, laminate flooring installation can begin. When laying first row of laminate flooring tiles, some space has to be left between wall and tiles which allow natural contraction of laminate flooring. Contraction happens because of differences in room temperature and room humidity. Tiles are usually laid in a way they form uniformed pattern. If installation is done properly, no seams shouldn`t be visible. Underlayment for laminate flooring on concrete can be foam, rubber or cork. Foam is most popular underlayment because it is budget friendly and is easy to install. Rubber padding is best for use on concrete surface. It offers very good protection from concrete humidity and is great sound barrier and temperature insulator as well. Rubber gives laminate flooring good stability which is very important. If flooring is not stable, tiles begin to bend and gaps between them start to occur. If water sips into gaps, tiles begin to swell and damage can`t be repaired. Cork padding is very good sound insulator. It is most often used in buildings with multiple apartments. Walking on laminate is very loud if no padding is placed under it. That can be very disturbing to the neighbours, that is why good underlayment is necessary. Can you put laminate flooring on concrete? Yes, you can. Concrete is the best and most reliable surface for installing laminate flooring. You have to make sure that concrete has no big surface imperfections, that it is completely dry and without any dirt. If those three criteria are met, you can install laminate flooring on concrete without a problem. 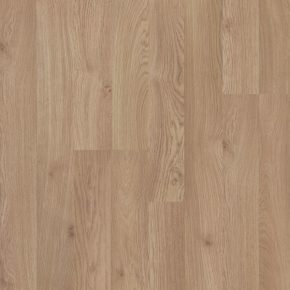 For easier installation you can choose to install laminate flooring with attached padding.